- The U.S.S. Constitution is located in the east of the Commonwealth, northeast of Diamond City and a short jaunt east of Bunker Hill. It sticks out of the buildings in the area like a sore thumb, and once you get close enough (assuming it’s a clear day) you should see the giant tub pretty easily. - The U.S.S. Constitution is an enormous sailing ship, albeit one with rocket boosters, and it has somehow come to rest atop an old bank. The bank has some Pre-War Money and Bottlecaps inside, but nothing else of value. One of the adjacent buildings is a little more useful, containing a Nuka Cola Quantum in a fridge on the second floor. - You can access the ship via the bank’s third floor, which will guide you up to a hatch in the Constitution’s hull. Inside is a hold full of robots. They’re friendly enough, given the voice that triggers the quest upon your entrance, but don’t press your luck by trying to steal anything. There’s a Master-locked cabin on the upper floor with some potential stuff to steal, including a Fusion Core, but, again, theft. - Head to the deck. Up here you’ll meet the first mate and Ironsides, the captain, who will ask for your assistance in righting the Constitution’s current predicament - namely, being stuck atop a bank. After Ironsides is done talking a group of Scavengers will attack, and you’ll have to help fight them off. You can drive a few them off by using the circuit breaker near Ironsides’ firing spot to set off the cannons; other than that, though, you’ll either have to snip Scavengers from the deck or leap down and fight them in the wrecked-out buildings surrounding the Constitution. - Speak to Mr. Navigator after driving away the Scavengers. (The Mr. Handy unit may have leapt off the ship during the fight, so be prepared to look around.) The unit will task you with retrieving several items for Ironsides. First up is a Guidance Chip. This will also trigger the use of a dinghy elevator at the rear of the Constitution, allowing easy access to the ship. The dinghy will lower whenever you get close enough. 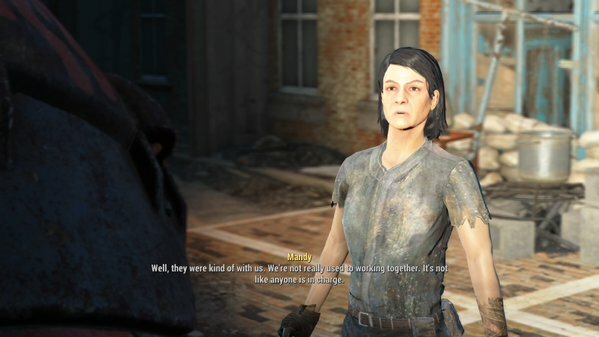 Mandy Stiles, a Scavenger in Fallout 4. She's kind of a douche. - Leave the Constitution and search the other side of the western building near the Constitution. Here you’ll find a woman named Mandy Stiles. She’ll offer you an alternative: help the Scavengers take down Ironsides and his crew. Mandy will not become hostile if you decide to remain with Ironsides, but her crew will attack if you try to take the NX-42 Guidance Chip out of the filing cabinet inside Mandy’s hideout without agreeing to help the Scavengers. Agree to Mandy’s terms to avoid a fight, whether you intend to actually help the Scavengers or not. - Regardless of your choice, return to the deck of the Constitution and install the Guidance Chip in the core guidance system, a small device at the bottom of the fore mast. Mr. Navigator will give you 250 Bottlecaps for the help, and if you speak with the ‘bot again it will ask for a Poseidon Radar Transmitter. - Head belowdecks and speak to the Bosun. After a long-winded profession of loyalty for Ironsides the Mr. Handy will ask you to repair the power cables. If you possess an Intelligence of three or higher you can Jury Rig the three power cables around the ship, all three in the hold, and be done with it. Otherwise, you can find New Power Cables in a box on the hold’s upper level which will do the trick just as well. - Speak to the Bosun again. This time the mournful robot wants a Power Relay Coil for the ship. The box where you need to install the Coil is a short walk from the Bosun, and if you have an Intelligence of five or more you can immediately repair the relay. Barring that you’ll have to go looking for one. You can find Power Relay Coils in some technology-related areas, such as military bases; on the ‘corpses’ of robots, such as Protectrons or Mr. Handys; or in the inventories of junk vendors, such as Trashcan Carla. - Return to the deck and hunt down Mr. Navigator again. It’s floating beside the guidance radar at the ship’s prow, which, surprise, requires repairing. It requires the Poseidon Radar Transmitter mentioned earlier. If you have an Intelligence of nine you can fix it immediately; if not, you’ll have to hunt a Transmitter down at a Poseidon facility somewhere in the Commonwealth. The Poseidon Reservoir in the far west of the Commonwealth has just such a Transmitter, in a steamer trunk on the lowest level. Mr. Navigator will give you 250 Bottlecaps for completing its little quest. - Speak to Ironsides. The big captain will ask one more thing of you: the ship requires some FLL3 Turbopump Bearings. 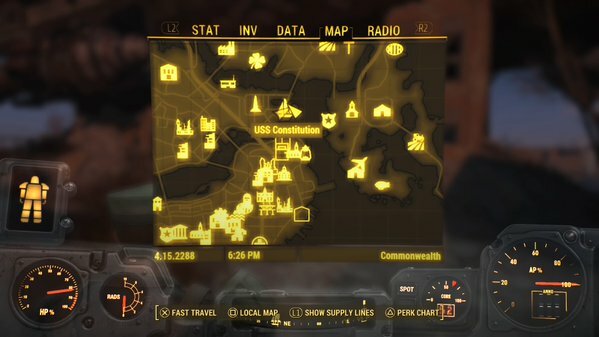 They’re located in the Corvega Assembly Plant, a large indoor location in Lexington, west of the U.S.S. Constitution. The Bearings are in a steamer trunk in the Plant’s uppermost room, in an office just off of the assembly floor. Now that you have the Bearings you also have a choice, assuming Mandy and her Scavengers are still around. The U.S.S. 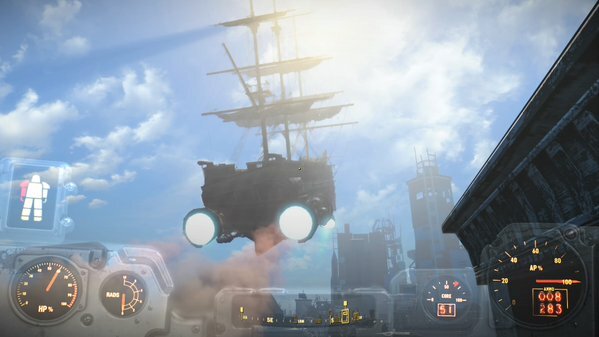 Constitution takes flight in Fallout 4. … and then request further aid when the Scavengers attack the ship. There’s a large number of the bastards, both on the street and in the buildings across from the Constitution, and you’ll have to defeat a fair number of them before they retreat. With Ironsides and his crew helping, though, it’s not too difficult a battle. After these Scavengers are gone you’ll need to head belowdecks for another prolonged gun battle, which, again, isn’t too bad, since you have lots of help. Return to Ironsides after repelling the Scavengers and he’ll give you the Broadsider, a ridiculous gun that fires Cannonballs. he’ll ask you to set the engines alight. You’ll find the circuit breaker needed to do this on the roof of an adjacent building. From here you can watch its… majestic… flight. WARNING! Do not join the ship on its voyage! It’s possible to get onto the deck of the Constitution while it’s taking off if you have a jetpack, and though the flight is fun, you’ll die at the end of it. So, uh, maybe save, try it once, and then just watch from the ground. Once the Constitution has finished flying the quest will end, though the ship can still be reached. It's now lodged in a building beside Faneuil Hall, across the water from where you last saw it, and you can reach the deck via two elevators, the first at the bottom of the building. Speak to Ironsides on the deck again and he'll give you a Lieutenant's Hat, as well as permission to use the captain's cabin as a sleeping area. Everything here will still count as stolen if you try to pick it up, mind, so don't store anything on the ship. Return to Mandy with the Bearings. Davies will ID them and Mandy will demand you hand them over. If you’re persuasive you can get her to give you 500 Bottlecaps extra, though the demands continue. If you refuse, or ask for more money, she’ll turn hostile; otherwise the plan proceeds. Install the degraded Bearings inside the captains quarters, as above, then speak to Ironsides. Once the captain asks you to fire up the engines, descend and speak to Mandy in a nearby building, then proceed to do so. Once the engines fail to light an attack will immediately begin, and you’ll be in a good spot to fire on Ironsides. You’ll have lots of Scavenger backup, too, so it’s not exactly a difficult fight - though it gets tougher when you speak to Mandy again, and learn that they’ve decided to betray you. You’ll have to trash all of them to complete the quest. Take out Mandy immediately, since she’s right in front of you, then get behind cover in the nearest building and pick off everyone else. In addition to the loot of the Scavengers and the robots on the deck, you can now steal as much as you like from the holds of the U.S.S. Constitution - though it’s filled with now-hostile Protectrons and a few Turrets. Everything in here will count as stolen, as well, so hopefully you plan on keeping the swag for yourself.